While the Progressive Insurance Automotive X PRIZE is over, its legacy lives on through the teams who took part in the competition. Teams will provide updates from time-to-time so that we may share their post-competition experiences and achievements. This latest entry is from David Brown, a team member of the Mainstream Category winner, Edison2. From our success in the Progressive Insurance Automotive X PRIZE comes an obvious question: What’s next for Edison2? The path we chose for the X PRIZE sheds light on the future of Edison2. From the beginning, we saw the key to efficiency lying not in the choice of propulsion but in the car itself, through the two absolute virtues of lightweight and low aerodynamic drag. We avoided the added weight of batteries needed for an electric or hybrid, choosing instead an internal combustion engine running on a gasoline/ethanol blend (not to say we neglected the power source – we got 110 MPGe on an engine that before modification got 70 MPG powering a Yamaha motorcycle). The result? 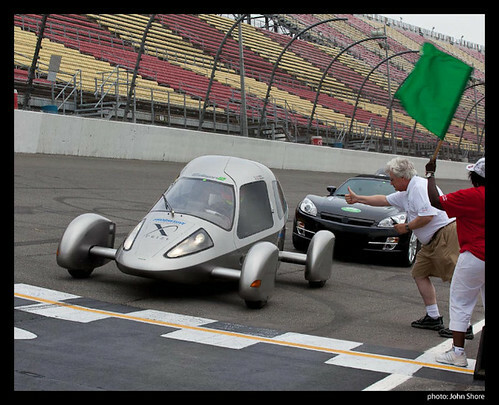 Not only did the Very Light Car win the Mainstream class of the X PRIZE, getting as much as 129 MPGe on the highway cycle at the Michigan International Speedway and achieving competition bests in handling and emissions, but it set records outside of the X PRIZE. Our car achieved the lowest aerodynamic drag ever recorded for a 4-seater at the GM wind tunnel, and the best coast-down numbers ever seen at Chrysler’s Chelsea Proving Grounds. We think cars built on Very Light Car principles are a necessary part of the future if the world is to meaningfully address energy and environmental issues, but there is a lot of work to be done. We are already embarked on designing the next generation of VLC’s, cars that are friendlier and more refined yet still maintain breakthrough efficiency. Safety now based on racing experience and theory needs validation through crash testing. We can show how other power sources will benefit from our platform efficiency; a Very Light Car with an electric drive will effectively cure range anxiety. The X PRIZE offered a generous incentive to jump-start innovation and a demanding schedule to accelerate development. Edison2 accepted the challenge and through careful analysis, thorough preparation and skillful execution captured the Mainstream class prize. The X PRIZE was the beginning; we are ready and eager for what comes next. When the Automotive X Prize was announced in 2007, the original intent of the contest was that the cars would be "desirable"; however, most of the cars were desirable in one respect only- low fuel consumption. I think a vital mistake was failing to set a minimum weight limit for the mainstream cars. What a shame! I was hoping that the Automotive X Prize would truly have made a difference. Perhaps, this can still help us down the path toward more efficient and eco-friendly vehicles in the future. Thanks for your post. John Shore actually addresses the issue of weight requirements in his post "Why No Weight Requirement" (http://autoblog.xprize.org/axp/2010/11/why-no-minimum-weight-requirement.html). I hope this will provide greater insight into the reasoning.